Relax, mild climate, wonderful landscapes, ancient villages that seem to remain untouched in the centuries… A wedding on the lake is a fantastic idea to live an unforgettable wedding day. The lakes of North Italy are full of amazing villas to set the wedding reception. The writer Stendhal loved Lake Como “where everything talk about love”. The region of Lombardia is full of beautiful lakes, the greatest in Italy. Our Piedmont is very similar, especially in the North. Lake Maggiore is one of the widest lakes in Italy, inside there are the three Isole Borromee that are famous for their “italian gardens”: Isola Bella, Isola dei Pescatori and Isola Madre. From the close Sacro Monte della Santa Trinità a breath-taking landscape will fill your eyes! Lake Orta is an enchanting place to set a wedding day, with its magnificent Isola San Giulio where in the narrow streets you can see old houses and baroque palaces. The Sacro Monte di Orta is part of Unesco World Heritage. In Piedmont you can find the natural park of the Avigliana Lakes, the “5 Lakes” of Canavese, the Roppolo Castle on Lake Viverone, and many other in Ossola Valley. The choice is very interesting if you dream of a Piedmont lake as scenery of your Great Day! Need more inspirations for your Wedding in Italy? take a look on your Magazine! 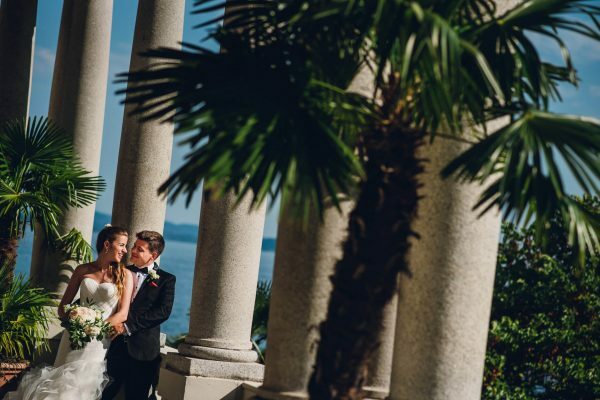 The Lake Maggiore in front of them, the Alps behind, the reception at Villa La Quassa, a wonderful wedding day! Marzia and Patrick got married in a wonderful wedding on Lake Maggiore, with their children Ilenia and Giorgia!